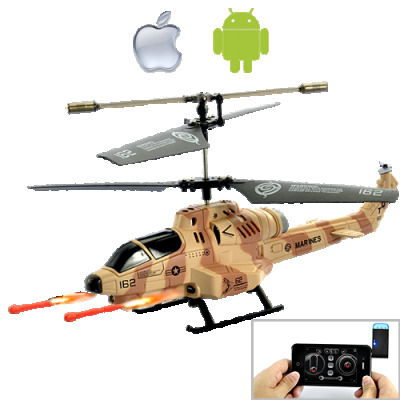 Successfully Added iHelicopter "Cobra" - iPhone/iPad/iPod Touch/Android Phone Controlled RC Helicopter (Desert Camouflage) to your Shopping Cart. Controlled using your iPhone, iPad, iPod Touch, or Android Phone, the Cobra iHelicopter is the world’s coolest RC helicopter! Even before you start it, just by holding it in your hand you will love it. Meticulously crafted with stainless steel, the skeleton is robust to withstand even heavy falls from 10 meters high. Covered with desert camouflage acrylic, the body is streamlined and beautiful. The iHelicopter is a true thing of beauty, just like the iDevices and Android phones which you use to control it. Flying the Cobra iHelicopter is easy and a lot of fun. All you need to do is download the FREE controller App from the App Store or Android Market and plug in the transmitter. The App features a band selection (A/B/C) which makes it possible to have 3 Cobra iHelicopters flying in the same area. You can use the app to perform a variety of movement, including left/right rotation, forward/back, hover and land, or even to launch missiles! The Cobra iHelicopter is guaranteed to be the biggest hit on your resale store. Buy wholesale stock at even lower discounted price today. Even if you don’t plan to sell it, you can buy it as a gift for family or friends who have an Apple product or Android phone. As always, this latest gadget of super awesomeness is brought to you by your source for hi-tech electronics, Chinavasion. Plug the transmitter in the audio jack of your iPhone, iPad, iPod Touch or Android Phone. Turn the volume to the max before flying the iHelicopter! "Apple", "iPod", "iPod Touch", "iPhone" and "iPad" are trademarks of Apple Inc., registered in the U.S. and other countries.